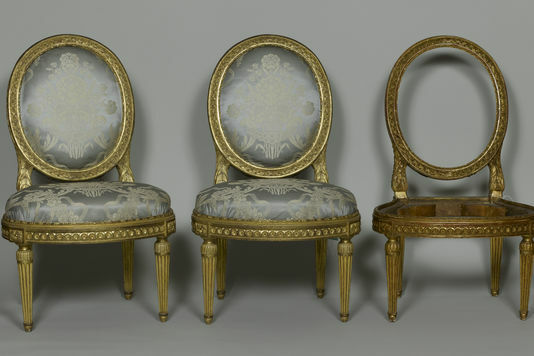 Rodama: a blog of 18th century & Revolutionary French trivia: Fake chairs in High Places! The French art world has recently been rocked by a series of scandals concerning the marketing of fake 18th-century chairs. In June 2015 the Jean Lupu, head of a respected dealership in the rue du Faubourg-Saint-Honoré and a man in his eighties, was accused of fabricating chairs using recycled wood and counterfeit stamps and fraudulently selling them to private clients. No further action against him is anticipated, but his company went into liquidation in February. At the beginning of 2015 a judicial enquiry was opened by the high court in Pontoise, in the context of investigations by the French art fraud squad, the OCBC, said to have been ongoing since 2012. It is rumoured that the authorities are on the trail of a considerable money laundering operation. On 7th June two high profile figures were detained for questioning: the antiques dealer Laurent Kraemer, and Bill Pallot, head of the Aaron Gallery and a specialist in 18th-century chairs. Pallot was accused of "organised fraud" and "aggravated money laundering". Having been held in custody for four months, he was released on 8th October pending trial in Spring 2017. A third dealer, Guillaume Dillée was arrested later in June. All three men involved are highly respected experts. Laurent Kraemer, is the fifth generation of the Kraemer dynasty. 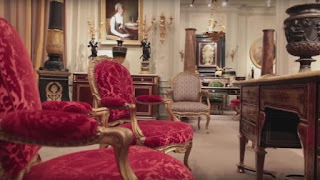 Founded in 1875, the Kraemer Gallery is the oldest dealership in Paris dedicated to furniture and decorative art. Laurent Kraemer is a member of the prestigious Compagnie nationale des experts (CNE) and an officier in the French National Order of Merit. He has stated publicly that he acted in good faith and has "never sold any furniture with the slightest doubt over its authenticity". Bill Pallot has been in charge of furniture at the Galerie Aaron for thirty years. He is an internationally recognised art historian, officier of the prestigious Ordre des Arts et des Lettres and author of the standard reference work on 18th century chairs. A "Dandy fantasque et érudit", with his trademark three-piece suits, long hair and round glasses, he is known affectionately in the trade as "le père Lachaise" . This collector and lover of the high life is said to have spent his four-month incarceration in a nine metres square cell with three other men, forced to take take turns sleeping on a mattress on the floor. Dillée, a respected Parisian arts consultancy, established in 1925. He has acted as an expert adviser to French Customs and has curated some of Europe's most important auctions of decorative arts: in 2012 he scored a major triumph when a marble bust by Edme Bouchardon which he had discovered was bought by the Louvre for 3.7 million euro. In 2015 Dillée announced a sudden decision to emigrate to Australia and set up a new business in Melbourne. The family art collection, begun by his grandfather, was auctioned by Sotherby's in March 2015 where it sold for the massive sum of 10.2 million euros. Didier Rykner in La Tribune de l'Art quotes a "former conservator" to the effect that a traffic in fake "royal chairs" had been known for more than ten years but had been tolerated because state museums were not involved. It would seem he was wrong. Versailles has, after all, been targeted. According to an official statement by the Ministry of Culture on 11th June, the chairs at issue, purchased by Versailles between 2008 and 2012, represent a total expenditure of 2.7 million euros! 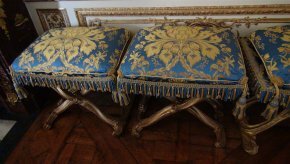 Two ployants or folding stools from a set made for the duchess of Parma by François Ier Foliot, currently on show in the Salle du Conseil. The dealer Charles Hooreman, a former pupil of Pallot's at the Sorbonne, claims to have examined the stools at the Galerie Aaron in May 2012 and judged them to be fakes. He was later stunned to learn that they had been bought for Versailles at a cost of several thousand euros. It is now thought that the two stools may be adaptations of known copies dating from the 1960s. The pieces were withdrawn from public view over the summer but recently returned to the Salle, on the grounds that they were not directly involved in current investigations. A chair made by the cabinet maker Georges Jacob, recently on display in the cabinet de la Méridienne, acquired in 2011 from Sotheby's for 400,000 euros. According to Didier Rykner the workmanship is demonstrably inferior to that of a genuine Jacob chair. In addition to those owned by Versailles, two chairs from the Belvédère suite are also under suspicion. The two chairs mysteriously resurfaced in 2012 and found their way to into the possession of the Galerie Kraemer. One was supplied by Guillaume Dillée. The Commission consultative des Trésors nationaux refused an export licence and declared both to be “national treasures” due to their “extremely high quality” and “original gilding”. In this case Versailles declined the right of preemption. The chairs were subsequently resold (for 3.5 million euros) to a well-known London collector for his hôtel in Paris. At the end of 2015, when doubts were raised, the Galerie Kraemer immediately took back the chairs and reimbursed him. According to recent reports Bill Pallot has now admitted responsibility for faking both chairs. When questioned in June 2016 Pallot admitted ordering five false lots, but denied organised fraud; his lawyer claimed that he saw his action as an "intellectual game". He now awaits trial. Pallot has had recourse to some of the finest craftsmen in Paris. Bruno Desnoues, widely considered to be the best cabinetmaker and gilder of his generation, was detained for four months.. (He is now apparently rehabilitated; Versailles has entrusted him with the highly prestigious commission of reconstructing Louis XVI's bed.) Louis Kraemer does not face prosecution: On 22nd July the Kraemer Gallery was placed under a legal safeguarding procedure, aiming at limiting financial liability. Kraemer insists that the firm is not in financial difficulties and will "fulfill all of its responsibilities". The case against Guillaume Dillée, if any, has not yet been made public; however, he is widely suspected of marketing the fake furniture. We await next year's exciting instalment! Although the individuals concerned have been widely condemned, the affair is also considered symptomatic of the difficult position of Paris's dealers, who increasingly suffer as a result of competition from London and New York. There has also been much criticism of the Versailles administration. Charles Hooreman found it obstructive: he signalled his findings in 2012 and obtained an interview with the Palace;s director Beatrix Saule, but no action was taken; it was claimed that Palace experts were "satisfied" with the authenticity of the chairs. Since a law of 2003 which provided for a 90% reduction in sums invested in "national treasures", Versailles has had vast funds of public money at its disposal; it is the biggest buyer of 18th-century furniture on the planet. Commissioners are accused of being more interested in opportunities for new purchases than in the authenticity of the pieces concerned. An investigation of the Palace's acquisition policy was promised by the Ministry of Culture in June but is yet to materialise. Personally I do not think Versailles was justified in spending 2.7 euros on antique chairs in the first place, especially ones which did not even come from the Château . The whole interior of the modern palace is a reconstruction, so why not just have replica chairs?